Home Events News Smartphones Vivo Vivo V15 with 32MP Pop-up Selfie Camera Launches in PH! Vivo V15 with 32MP Pop-up Selfie Camera Launches in PH! 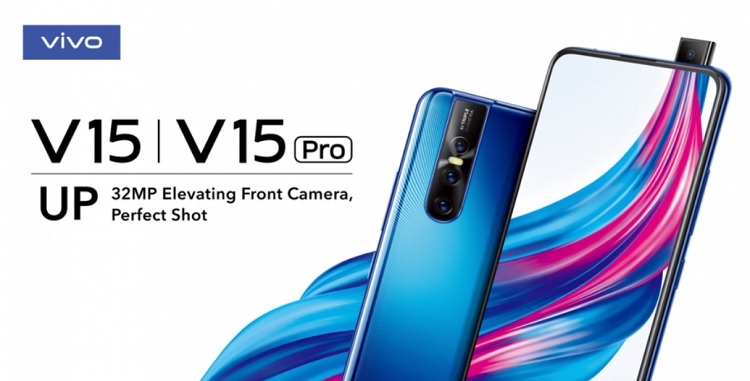 Apart from the beefier V15 Pro, Vivo also unleashed the regular V15 smartphone in the Philippines. The V15 comes with a slightly bigger 6.53-inch FullView display with 91.64% screen-to-body ratio. And just like the pro model, it is also mounted with a pop-up selfie camera. However, inside, it is powered by Helio P70 octa-core processor, and a smaller 6GB RAM paired with 128GB storage. Tricky enough, it is geared with a larger 4,000mAh battery that supports dual-engine fast charging, too. As a toned-down variant, the V15 just sports a 12-megapixel f/1.78 main camera, 8-megapixel f/2.2 ultra wide-angle lens, and a 5-megapixel f/2.4 depth sensor. As a quick recap, the V15 Pro boasts an impressive 48-megapixel primary shooter. For selfie, the same 32-megapixel pop-up snapper is found on the V15. The Vivo V15 is priced at Php17,999. It will be available for pre-order beginning March 21 to 29, and those who will get it will also score an NBA Premium Gift Set that includes a Bluetooth speaker and an NBA case. Sounds like a deal? Let us know what you think!